This cradle rocks on ball bearing glider brackets so it's smooth and quiet. It is pictured in pine with our 9" birch spindles. If you are building yours in oak, order 9" oak spindles. Large stationary shelf on the bottom provides extra storage. Uses standard 2" x 17" x 34" cradle pad. 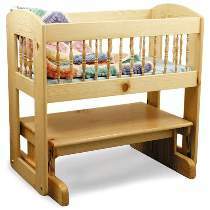 Measures 25"W x 36"L x 37"H. Order 30 spindles, one set of glider brackets and cradle pad separately or see special offers. #6064 Special includes plan, cradle pad, glider brackets and birch spindles. #6065 Special includes plan cradle pad, glider brackets and oak spindles.